Oberheim family of products aka 'The System', including the OB-Xa and OB-SX synthesizers, the DSX digital sequencer and the DMX digital drum machine from page 7 of Keyboard Magazine June 1982. My recent blog posts have been about "The System" - but those posts were all about the Oberheim 1983 System which included the OB-8 synthesizer. Here is an ad featuring the older version of "The Oberheim Performance System" circa 1982. *THIS* is the system I dream about at night. I drool every time I look at it. I not only drool because of the gear-nerd that I am, but also because the marketing guy in me knows a good thing when he sees it. This ad documents the point in time that Oberheim's marketing department finally started to push the concept that "the whole is greater than the sum of it's parts". And The System is born! I also dig these earlier Oberheim ads because they feature these particular pieces of gear. And knowing when the OB-Xa, DMX and DSX started showing up in ads helps give us a good idea of just how long the tech *behind* the Oberheim system had been around before MIDI made it's commercial breakthrough. Before doing research, I was thinking ---> This ad started showing up in June 1982? The first MIDI synth came along shortly after in 1983. Bah! True. But as it turns out the the actual technology behind "The System" was available long before this first ad. I started looking back at old issues of Keyboard to see just how far back the technology went, and, even more interesting to me, how Oberheim positioned these pieces before "The System" as a whole made an appearance. I found one of the earlier direct mentions of the multi-pin connector back in the June 1981 Keyboard review for the OB-Xa. The interface is mentioned very briefly in the description of the rear panel, where Dominic Milano writes that the owner's manual explains it "is for interfacing the instrument with future Oberheim products". Just a month later in the July 1981 issue, Oberheim began running a two-page advertisement for the DSX Digital Polyphonic Sequencer and DMX Programmable Digital Drum Machine. 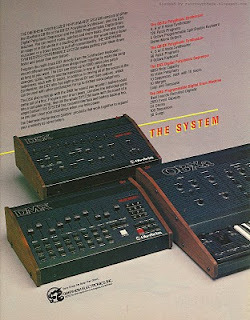 The photo in the ad has the two featured products up front, and shaded out in the background is the OB-Xa synthesizer. This is the first sighting I've found of the three pieces together. There is a lot of ad-copy in this two-pager, including one brief bullet point on the DSX's side mentioning that the DSX sequencer "interfaces directly with the OB-X, OB-SX and OB-Xa and the new DMX". "The OB-Xa, DSX and DMX are amazing by themselves, but together... watch out!" But, still no direct mention of "The System". Come on, Oberheim marketing guys - MIDI is getting closer and closer to launch! And in the January and February 1982 issues, Oberheim runs another two-page ad featuring the the updated OB-Xa with 120 programs. Again - only a brief mention that "The OB-Xa is interfaceable with Oberheim's DMX Digital Drum machine and DSX Digital Polyphonic Sequencer". But, gah! It's been almost a year since Oberheim started putting these three pieces together in ads, and the Marketing Department still hasn't turned it into "System" gold! And then, a few months later... BAM! In the June 1982 issue of Keyboard ("The New Synthesizer Rock" issue with Michael MacNeil of Simple Minds playing an Oberheim OB-Xa on the cover - sweeeeet! ), we finally have this first "The System" ad on page 7, directly across from the "Letters to the Editor" section. Great real estate! And what a beauty it is. These three pieces of gear look great together, all wrapped up snuggly in their "System" marketing package. Seriously. So, although it took until June 1982 to finally call this 'The System' in advertisements, Oberheim obviously had the system in mind since at least June 1981. And if you take into account that I probably didn't catch the first documented instance of the tech, and the fact that the development of the OB-Xa started much earlier... then Oberheim probably beat out MIDI by more that two years. Oberheim 'The System' rebate advertisement, including OB-8 synthesizer, DSX sequencer, DMX drum machine, and Model 700 amplifier from page 22 of Keyboard Magazine January 1984. What a great ad. What a great font with "REBATE" spanning to width of the page! At a time when most of the big synthesizer companies were churning out full-colour ditties with fantastic photography, Oberheim gets reader's attention with a full-on black and white all-text ad. Including '$500 cash' in big bold letters doesn't hurt either. My last blog post featured Oberheim's first 'The System' advertisement. 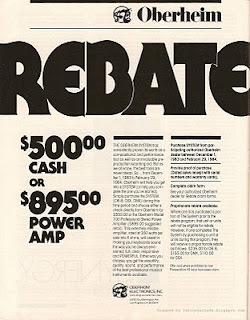 It started running in keyboard in late 1983 through to early 1984 - and this rebate advertisement started running along with it for a few issues during the holidays. Oberheim even had the two ads appearing across from each other in the February issue (last page and back-inside cover page). This stark, clean rebate ad on one side, and that gorgeous photography of 'The System' on the other. And, you gotta admit, Oberheim gear *is* gorgeous. Along with being relatively easy to learn and use ('clear and logical' was how Jim Aikin described it - more on Jim's views below...). And every Oberheim synthesizer I've come across has been built like a tank. As stated in this advertisement, "...as we all know, the best tools are never cheap". So, $500 off a full Oberheim system is a nice little holiday treat. Considering that together, the OB-8, DSX and DMX cost a little over $9,000 at the time, that's a good five or six per cent discount. I have to keep reminding myself that I can't think of this $500-off deal in today's terms, where five or six percent wouldn't even make it into that coupon book your little sister is selling for her school fund-raiser. Back then, synthesizer price-points were much higher and there were far fewer bedroom musicians around expecting a great deal every time they walked into their local music store. Plus, I'm gonna go out on a limb and say if you were buying $9,000 worth of gear back in 1984, you were probably doing okay as a musician, or were seriously thinking you were going to be doing okay in the near future. So, $500 off is icing on an already really delicious cake. Jim Aikin reviewed all three pieces of the Oberheim system - the OB-8, DSX, and DMX - in the April 1983 issue of Keyboard, interestingly, months and months before any of 'The System' advertisements started to appear. "A number of manufacturers are getting into the business of building whole lines of "modules" that are designed to be electronically compatible, and that are hooked together with patch cords. The difference is that the "modules" are no longer simple things like oscillators or filters; they 're complete musical instruments and accessories, each with its own complex internal structure. " "You might be able to cobble together similar units by three different manufacturers and get them to talk to one another, but there might be a lot of headaches involved in getting them all operating smoothly and predictably. The people at Oberheim have gone to a lot of trouble to eliminate the headaches... the advantages of having an integrated setup should be obvious." "The System is in many ways a remarkable set of equipment. It's materially more advanced in design than the kind of hardware we were dealing with only a couple of years ago, and the musical potential is correspondingly great." But, here's the thing. Well, two things. 1. The article doesn't mention MIDI. Not even once. Companies have already agreed on the MIDI specs and the Prophet-600 advertisements have been out for a couple of months already. I guess I have to keep reminding myself that MIDI still wasn't a 'sure thing' at this point, and history has shown that there has been a a lot of good 'universal' technology that had missed the boat and not taken up by the masses. Maybe Jim was just trying to keep the article from getting even more complicated than it already was. 2. Could that rebate offer be partly due to the pressure Oberheim must have been feeling as MIDI inched it's way forward? As pointed out in the previous blog post, certain individuals at Oberheim were apparently a little on the anti-MIDI side earlier in MIDI's development phase. They had spent a lot of money and time coming up with their own proprietary technology. I better stop before the conspiracist in me starts rambling. And, for the record, I *heart* Oberheim. Oberheim family of products aka 'The System', including the DX and DMX digital drum machines, DSX digital sequencer, OB-8 synthesizer and 700 professional amplifier from page 59 of Keyboard Magazine October 1983. 'The System' - sound familiar? It should. Because Oberheim was already part of a 'The System' back in 1978, which included the 360 Systems Slavedriver and Oberheim SEM. Then, in mid-1982, Oberheim came out with their own 'THE SYSTEM', packaging their own OB-X and OB-XA synthesizers with their DSX sequencer and DMX drum machine. Synths, drum machines, and sequencers that all worked well together through their own proprietary technology. Jump to the beginning of 1983, and Oberheim decides to replace the aging OB-X and OB-XA synthesizers with the newly designed (internally anyways) OB-8 - advertised as having the sound of the OB-XA, but with many new features and a lower price. Now, if you are still with me, and you have been reading the last couple of my blog posts, you know that by the beginning of 1983, the universal MIDI standard had been introduced to the masses in the form of the Prophet-600, and other companies were also on board. MIDI had the potential to allow all synthesizers, drum machines, and sequencers to work together - no matter what manufacturer they were from. But, their was still a lot of hesitation in the industry on whether MIDI would get off the ground, and on the surface at least, it looks a lot like Oberheim, with this 1983 advertisement, was betting on that fact by reintroducing their own system of perfectly connected machines to the masses in the hopes that they could leverage their technological investment as long as possible. So, was it as clear-cut as that? Was Oberheim protecting it's tech investment? Or did it go deeper? An article in the June 1984 issue of Keyboard called 'Turmoil in MIDI-land' discusses a lot of the issues surround the launch, confusion, and implementation of MIDI by different manufacturers, and includes an interview with Tom Oberheim. One of the questions/answers includes mention of 'The System' and where the company stood on MIDI in the past. "You were pegged as being very much anti-MIDI when it was first being proposed. Do you still feel that way now that you've started including MIDI on Oberheim instruments? We made some statements early on that gave people the impression that we were anti-MIDI. That was more an opinion of individuals at Oberheim, not the attitude of Oberheim, the company. I think that MIDI will further to a great extent what we started three years ago with our system idea." Opinions count for a lot, and I would guess that those individual's anti-MIDI opinions at the time may have helped keep steering the company towards it's own proprietary standard. Plus, in a way, Oberheim had history on their side. In 'the good old days', keyboard players and synthesists were very brand specific. Because there wasn't a universal compatibility between those high-priced synthesizers, I'd bet Moog people tended to stick with Moogs,Oberheim people tended to stick with Oberheim, ARP with ARP, etc. There's always a good reason to think that the future will remain the same. But, as synthesizers became more compact and price points came down, players began to build up their synth stacks with many different brands. The game started to change. Suddenly, that good ol' company strategy of a closed proprietary system to help keep your clients investing in your new products, may not look like such a great idea. Unfortunately for those companies, a universal standard might be the only logical conclusion to come to, because as soon as two of your competitors start to share their tech, they would have a distinct marketing advantage over a company that didn't share with anyone. Better to support a universal standard than to try and go at it alone. Plus, you have to take into account all the pressure that was probably coming from the outside world. If you look back at those Garfield ads I blogged about recently, you could say that Pia Zadora and all those other famous users listed in those advertisements were making a statement when they bought a Doctor Click. They were effectively telling all those companies that they wanted to use many different brands of sequencers, drum machines, and synthesizers. TOGETHER. I'm not saying that Oberheim's system wasn't good. Apparently it was VERY GOOD. The fact that 'The System' continued to be advertised in Keyboard well after their own MIDI-equipped Xpander and MIDI-option for the OB-8 became available, goes to show just how powerful 'The System' probably was. So, maybe 'anti-MIDI' goes a little too far. 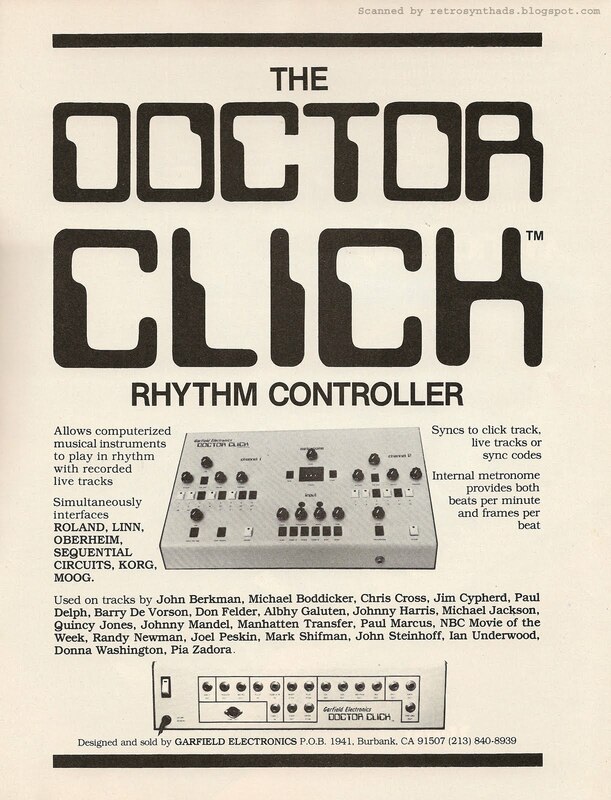 Garfield Electronics Doctor Click Rhythm Controller advertisement from page 29 of Keyboard Magazine December 1982. The ad itself it actually pretty well-balanced. Maybe a bit top-heavy, but, right away, the eye definitely catches the name of the device in that really cool computer techie font that I used to see on many early rave posters. The photos are great too - large enough that the reader can even make out some of the front panel text. And, Garfield was smart to show off the back panel with all its connections, enforcing the message that this thing has more in's and out's than you can shake a DIN cable at. Garfield also took a page out of ARP's marketing plan and provided a list of artists who's tracks had used the device. Pia Zadora? Really? 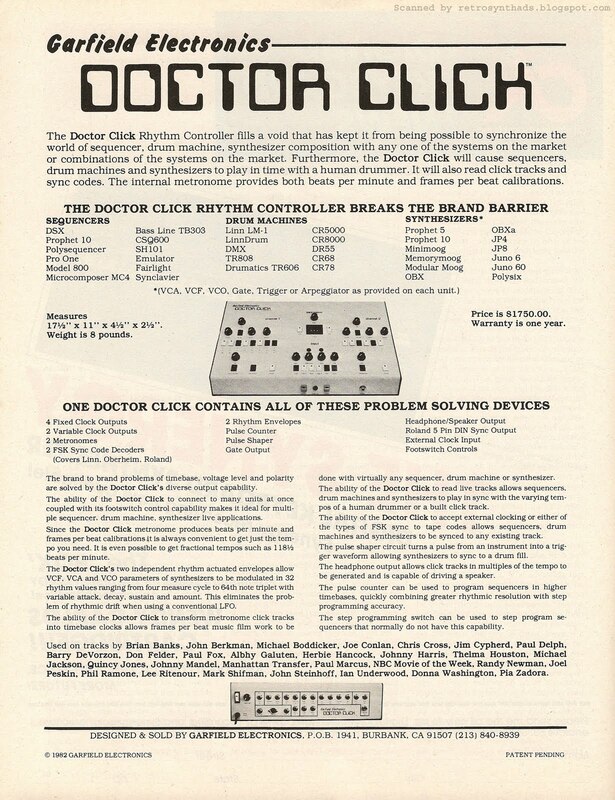 So, what exactly is Doctor Click? How did it come to be? I guess you could say that it's all about timing... pun absolutely intended. Go back to late 1982. At the time, synth companies weren't really open to talking to each other much about their technology, and the result was that pretty much every company had developed a different standard to sync their own gear. For a musician or producer, trying to sync up all that different gear must have become increasingly painful. "Those of you who have tried at one time or another to interface various electronic music devices together have probably noticed that this is easier said than done. Not only do different synthesizer arpeggiators accept different kinds of triggers - some positive-going, some negative-going, and so on - many drum machines use particular timing references (sync tracks) which make them incompatible with other drum machines." 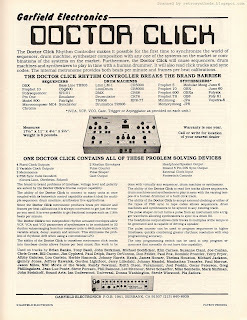 "Doctor Click is not a keyboard instrument, not a drum machine, and not a signal processor: What it does is synchronize and interface these three families of devices together. Not only can it interface to existing sync tracks, it can build up click tracks from incomplete click tracks, and even create sync and/or click tracks which are referenced to a live musician." The review does a great job of explaining how to use Doctor Click, including an example of how Craig used the device when the original sync track on one of his recordings was accidentally erased. Great stuff. In his conclusion, he has nothing negative to say about the functionality of the machine itself. He explains that Doctor Click's 'Achille's Heel' was that with all the cords running in and out of the unit to all those different synths and recording gear, it was really easy to create grounding issues that would introduce noise into recordings. Hmmm... I had never even thought about that - and I experience it every day with all my gear running through my old trustly Mackie 24 channel 8-bus mixer with the 24 channel side-car -- Doh! But, my biggest issue with the device was the cost. 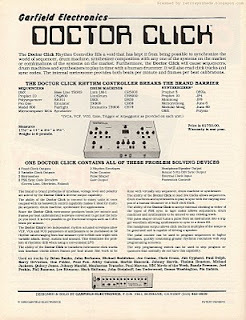 The Doctor Click initially went for $1,950.00, with an expanded version up'ing the price to $2,295.00. To me that seems steep. You could get another synthesizer or two for that price. Sure, the device was cutting-edge with its ability to sync Roland, Linn, Oberheim, Sequential Circuits, Korg, Moog and virtually every other synthesizer and drum machine out there - as well as humans. And as far as I know there was nothing else around at the time that could do what Doctor Click could. So, maybe it was worth it. "...once you have the Doctor Click, you really are set - this one device solves just about every common (and not-so-common) interfacing problem you might encounter in the studio or while playing live..."
Those issues aside, Doctor Click is a great example of a company seeing an increasingly open opportunity and creating a nicely packaged solution. Sequential Circuits Inc. Poly-Sequencer advertisement (including the Prophet-5) from Keyboard Magazine. The ad on the left is from page 89 of the November 1981 issue, and the one on the right is from page 7 of the July 1982 issue. Versions of this advertisement ran in Keyboard Magazine for about a year and a half. The first version started showing up in late 1981, and was replaced by the second version in mid-1982 when the sequencer was upgraded with more memory. That ad continued to run well into 1983. SCI had a bit of a dilemma on their hands when designing this ad. 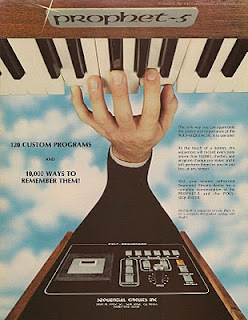 Yes, it was primarily a Poly-Sequencer ad, but because a user had to have a Prophet-5 in order to use the sequencer, the company had to make sure to get Prophet-5 users' attention. Thus, SCI chose to punch Prophet-5 users in the nose with a big fat 'Prophet-5' logo at the top of the ad, and then use the unique imagery of the hand/arm to draw their attention down to the Poly-Sequencer. The reader's eye doesn't come across the word 'Poly-Sequencer' text until they finally either find it on the photo of the machine itself or in the ad-copy. But, stick with the ad long enough, with it's lovely blue-sky-and-clouds Ear-Force-themed background, and SCI eventually gets their point across. I find it very fascinating that this ad was still being run in Keyboard Magazine well into the middle of 1983, months after their first ad for the new MIDI-equipped Prophet-600 started to appear at the beginning of 1983. A stark contrast - the end of an era, and a new beginning. You have one SCI ad marketing a piece of gear so closed-ended that it only works with their own Prophet-5/10 synths, and another SCI ad marketing a piece of gear designed to work with ANY other manufacturer's piece of gear (eventually...). In the same issue! But just like all the other companies that were starting to think about how/if/when to transition to this new universal standard called MIDI, SCI still had to worry about the present. Hence, stick with the old while promoting the new. When this sequencer was first released, it already had some competition, but by 1983, there was a wide range of analog and digital sequencers on the market. Keyboard magazine did a great little 4-page sequencer round-up article in April 1983 called 'Analog and digital sequencers. A survey of current models'. Included in the article was info on a number of both stand-alone and integrated sequencers from Aries, Buchla, E-mu, Korg, Moog, PAIA, Polyfusion, Roland, Serge, Gleeman, J.L Cooper, Oberheim, Multivox, SMS, Digital Keyboards, NED, and, of course, a small paragraph on the Poly-Sequencer. "The Sequential Circuits 1005 is a five-voice sequencer designed to drive a Prophet-5 or Prophet-10 (it is offered built into the 10). In its original version it stored 2,600 notes, but a recent upgrade has expanded this to 10,000 notes, which can be apportioned in any way over six separate sequences. Sequences may be recorded either in real-time or in single-step mode from the keyboard. The 1005 remembers program changes, and it has a built-in cassette deck so that sequences (and also the Prophet's programs) may be stored on tape. Editing functions allow for insertion, deletion, or timing changes." The conclusion to this article on sequencers is very reflective of the time, and although MIDI isn't mentioned at all, the author touches on one of the themes of my posts lately - how the introduction of MIDI was about to completely change the synthesizer/sequencer/computer landscape. "As we've seen, every manufacturer takes a slightly different approach to the design of digital sequencers. The field is developing rapidly, and there is still little uniformity. because the design is mostly a matter of writing computer software that will function within the limits imposed by the microprocessors inside the machine, the present generation of sequencers reflects the preconceptions and musical concerns of the people who are programming them, as well as the abilities and limitations of currently available chips. Within a couple of years, we'll be seeing a shakedown period, in which the more aggressive manufacturers borrow ideas from one another, evolving (probably) a more uniform sequencer design with more capabilities at a lower price." Good online reference information on the Poly-Sequencer is still rather hard to find at the usual synthesizer sites. You can find some good photos from a relatively recent eBay auction on MATRIXSYNTH. Check out the built-in digital cassette deck for storage! There is also a photo of a Poly-Sequencer, with a manual and some cassettes, along with a Prophet-5 on Synthfind.com. "This sequencer is very easy to use. To record a sequence, simply press the Record Switch then the desired Sequence Switch. The recording will automatically begin when you play your first note. When you've finished playing, hit the Stop/Continue Switch (or the Stop Footswitch) to end the recording and the sequence will start playing back. That's all there is to it!" Sequential Circuits Inc. Prophet-600 synthesizer two-page advertisement from page 46 and 47 of Keyboard Magazine July 1983. This advertisement had a good long run in Keyboard magazine throughout most of 1983 and into the beginning of 1984. And rightly so. The Prophet-600 holds a special place in synthesizer history as the first commercial keyboard to include MIDI. Whenever I show this ad to people, the first thing I always point out is the background. 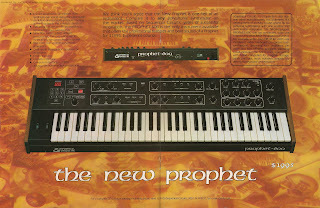 The imagery is a blending of all the older Prophet ads, including the Ear-Force series of ads for the Prophet-10, Prophet-5 and Pro-One. This excites me very much, even if the smaller text on the right and left sides of the ad tend to get a little lost. The two-page spread allows the reader to get a real good look at the front panel of the instrument. They also include a back panel shot, mostly to give the 'Prophet-600' name a bit more promotion (its a bit harder for the eye to catch on the front of the instrument in the main photo), but also to show off that lovely new MIDI interface. As you may know, Sequential Circuits Inc and it's president Dave Smith played a big role in the development of MIDI, and so the creator of the ad rightly slapped a big fat call-out box in the top-right corner of the ad, packing it with copy explaining this fact - in a refreshingly non-boastful way. 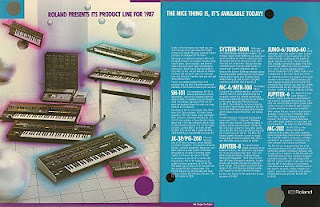 In comparison to SCI's big MIDI push in this ad, Roland also ran an ad in this July issue which included two new MIDI-equipped synths - the Jupiter-6 and JX-3P. But Roland chose to save any big promotion of MIDI for another day, and instead just slipped the term in when necessary. But SCI wasn't alone in promoting MIDI in a big way this early on in the game. In fact, Keyboard Magazine itself was a huge playa in helping get the ball rolling. One of the earlier mentions of MIDI in Keyboard was way back in October 1982. In that issue, our good friend Bob Moog wrote an article entitled 'More On Computer Interfacing' for his 'On Synthesizers' column. Bob actually started the topic of computer interfacing in the column a month earlier (September) when he wrote on the Apple II/Rhodes Chroma interface, but at the end of that article he promised to discuss 'the work done by other synthesizer manufacturers' the next month. "Last year about this time, Sequential Circuits president Dave Smith proposed a "universal interface standard" that would create compatibility among synthesizers and computers. That is, the circuit and data formats as defined by Smith's standard would, if adopted by synthesizer and computer manufacturers, allow a musician to use any synthesizer in combination with any computer, with no special additional interface circuitry and with basically the same software." "One can envision a lively business in novel, creative electronic music accessories that tie right in to the universal interface, and the emergence of a host of "software publishers" who write performance, composition, educational, and recreational programs." Not surprisingly, MIDI is also more than just briefly mentioned in the Keyboard Report review of the Prophet-600 in the May 1983 issue of Keyboard. Generally speaking, report writer Jim Aikin was impressed with the synth, noting that "the 600 has been streamlined for the more typical keyboard applications rather than for special effects" and that the "instrument offers a wide variety of pleasing musical sounds". Jim divided the review into the typical sections, including The Programmer, Arpeggiator & Sequencer, Modulation Section, Oscillators, Filter & VCA, and back panel sections. "This idea is still in it's infancy; eventually, MIDI connections may become a commonplace item, but so far, the Prophet-600 is the only instrument equipped with them. In order to test MIDI, we got two Prophet-600s and hooked them together." "If the MIDI idea catches on (which we hope it will), the Prophet-600 could easily become the basic keyboard for an extended set-up." Roland family of products advertisement including SH-101, JX-3P/PG-200, System-100M, MC-4/MTR-100, Jupiter-8, Juno-6/60, Jupiter-6 and MC-202 from page 14 and 15 of Keyboard Magazine July 1983. The Roland 'We Design The Future' tag-line had been showing up in Roland's brochures for months now, but up to this point, their advertisements were still mostly designed around it's 'Understanding Technology Series' ads like those created for the TB-303/TR-606 or Jupiter-8. Black backgrounds, strong colours, and lots of text. Their recent Juno-6 and Juno-60 ads started to mutate away from that design, but I'd still be inclined to classify them as such. "What?" you say? Where is the tag-line? You can see it at the bottom of the ad in the purple-coloured bar. Yes, it's small. Really small. Almost an afterthought. And unfortunately, I think this is the last advertisement to use the tag-line. Roland decided to pull in a few other common design elements found in those brochures by using a textured background and an accent piece (in this case a tile pattern background and spheres), but I have to say I miss the brochure's slick photo with mood-lighting. A really nice family photo done in that style would have looked sweeeeeet! Instead, it looks like Roland decided to comp together an image using a few effects that I would guess got onto the wish-list for Photoshop 1.0. This advertisement was a first for Roland in one other important way too. They mention MIDI! And so we get to the whole point of this ad. As mentioned in a recent brochure blog post for the TB-303, TR-808, TR-606 and CR-8000/5000, Roland had been pumping out A LOT of DIN-sync technology for a while now. They had a lot invested in it. And then along comes MIDI, and Roland has to convince current owners of Roland gear that the gear they just bought is not going to be obsolete in a year. And more importantly, they have to convince future owners that they are looking out for their future as well. The ad title text handles this perfectly. 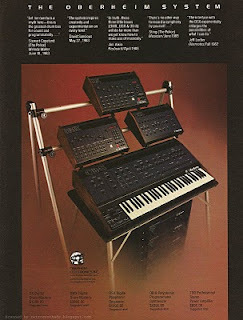 "Roland presents its product line for 1987. The nice thing is, it's available today!" Interestingly, they make no mention of MIDI in that title or in the opening paragraph. Its not until the reader gets to the JX-3P text that MIDI is mentioned - and a definition is included next to it - "a new system of interface developed for computer-controlled instruments". A year from now, and ALL synthesizer ads will feature the word MIDI heavily in either the title or ad-copy. I pulled out the July 1984 issue of Keyboard just in case someone called me out on that statement, and sure enough, MIDI has pretty much taken over. 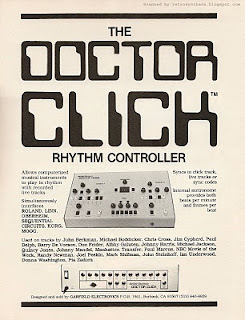 Heck, Roland's own ad title in the July 1984 issue was "Enter the world of MIDI". But jump back to July 1983, when MIDI is just getting it's feet wet, and Roland is smart to stay firmly on the fence for now. By promoting both their own protocols as well as MIDI, they let readers know that no matter when they buy from Roland, the gear will be compatible one way or another. And it wasn't just Roland that was playing the waiting game. Many companies either hadn't included MIDI in their gear yet, or if they had, they didn't say too much about it in their ads. 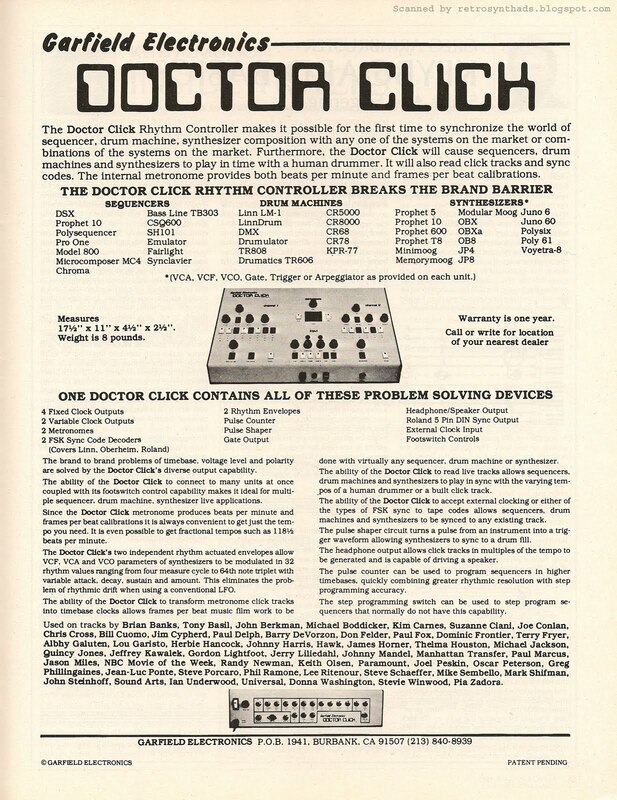 The July 1983 ad for Garfield Electronic's Doctor Click (the godfather of sync) didn't include MIDI yet. Neither did Octave-plateau Electronic Inc.'s Voyetra-8 ad. 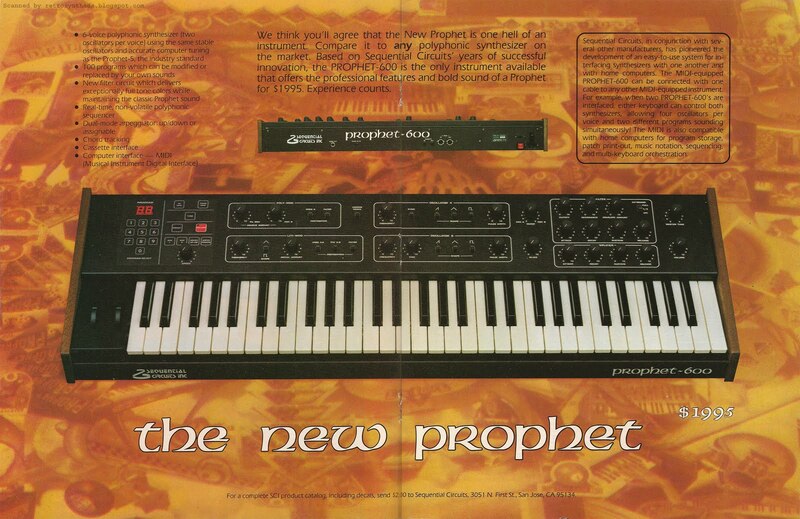 The ad for Sequential Circuit Inc.'s Prophet-600, the first commercially available MIDI synthesizer. Their ad has a large call-out box extolling the virtues of MIDI. And no wonder - SCI was heavily involved in MIDI's development. Nice! I'll post that ad in the near future. End note: This has always bugged me. Why did Roland pick 1987 as the 'future'? There is a design rule-of-thumb that says never to use even numbers. So maybe the thinking was that '84, '86, '88 would be out of the question. '85 is probably too close. And '89 is too close to '90. 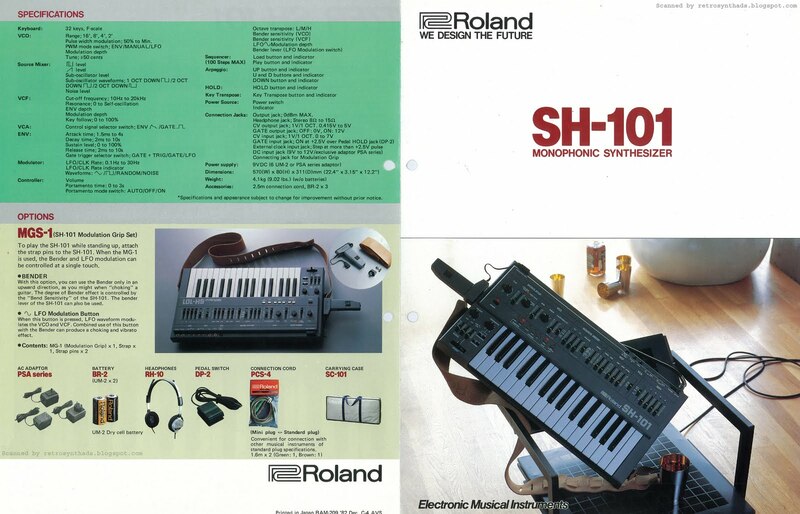 Roland SH-101 brochure from 1982. I know that the first thing I think about when it comes to making music with an SH-101 is hard liquor. Most of the Roland 'We Design the Future' brochures that I've come across from around this time period feature a front image that includes a stylish photo of the instrument(s) along with some mood lighting and an accent piece - something like plexi-glass cylinders, gray tiling, or even glass marbles such as can be seen on the cover of the Roland Rhythm Machines brochure (303, 606, 808...) I just blogged about. But the photographer Roland hired for this photo shoot decided that nothing screams monophonic mini-keytar synth like wood flooring with what looks to be a bottle of J.D. in the background. I'm not complaining - I'm a big fan of Jack. It's just an interesting choice. According to the print info on the back page, the brochure came out only a month after the Roland Rhythm Machines brochure (see link above) . And like that brochure, this one also pulls in other Roland gear so the reader can get an idea of all the compatibility options available in Roland's gear-world - in this case some nice clean diagrams (with photos!) of the pre-midi sync options available with the TB-303 and TR-606, as well as cv/gate control options with the CSQ-600/100 and MC-4. 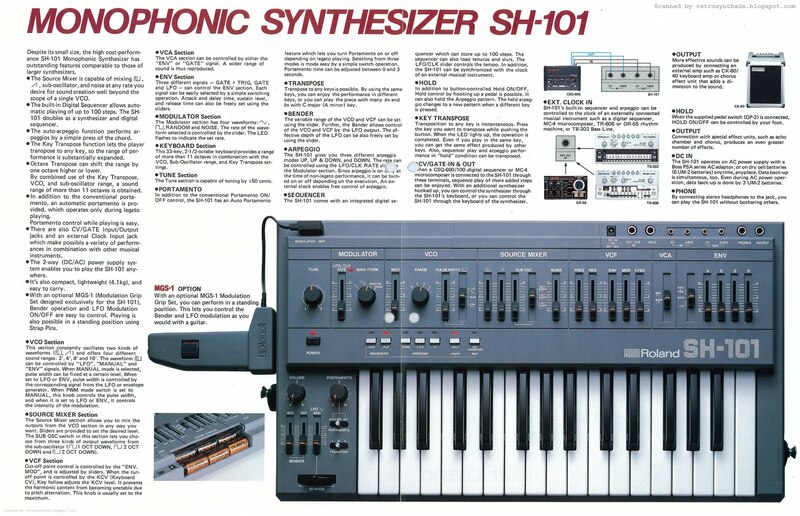 As for the synthesizer itself, it's tough to say whether or not Roland really knew what they were trying to achieve with the SH-101. On the one hand they wanted to shrink the hell of out it. 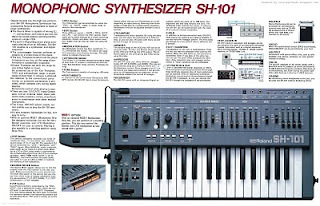 But on the other hand, unlike the 303 and 606 that took shrinkage to a whole new level, Roland also wanted the SH-101 to be a performance machine - one that you could pull over your shoulder, slap on the optional MSG-1 controller, and give your guitarist a run for his money at the front of the stage. "...the SH-101 clearly demonstrates Roland's change of attitude to what it thinks we need in this type of instrument. It's goodbye to all the 50 million routing permutations and modulation applications that were offered on the early SH models and hello simplicity, hello end-product controllers. By end-product controllers, I mean all those things you can do with a basic sound once set up. Not only does the SH-101 have a vastly expanded performance panel, but there's a multi-mode arpeggiator and even a small sequencer." You just have to look at the excellent reference information included in this brochure to get an idea of what Julian is talking about. Those inside two pages are packed with great info, along with a really really large front panel shot of the SH-101 itself. Roland was definitely changing things up from it's earlier synthesizers. We're talking a full monophonic synth (plus sub osc), arpeggiator, sequencer, two-and-a-half octave keyboard, great performance control, and a modulation grip/keytar option. Now, pack all that into nine-pounds of multi-coloured goodness and give it a list price of just under $500 - that's quite the deal. Compare it to the competition of the time to get a good idea of just what a great job Roland did. The Moog Liberation (Wikipedia), has a full-size 3.5 octave after-touch keyboard with an internal monophonic synthesizer (and poly organ). But had a list price of $1395 at the time, and has been described by more than a few as bulky and heavy. Sequential Circuit's Remote Prophet (Vintage Synth Explorer) brought the price point down to just under $900, had a four octave keyboard and was relatively light weight, but only worked with the Prophet. The Yamaha CS-01 put Roland to shame in the shrinkage department (Vintage Synth Explorer). $295 got you a monophonic synthesizer with breathe-control and a very small, thin, and light weight package. But it's 32 mini-keys probably made it too small for professional multi-octave solo-riffs. I think if you take the best of each of these machines, you pretty end up with an SH-101.